The perfect sandy beach is rare in cottage country. And to find a cottage with over 200 ft of beach, with sandy walkout to the water; beautiful views….and a great cottage…well, this could be your piece of heaven. Barry’s Bay is a vibrant little town to the east of Algonquin Park. Blessed with a stunning backdrop of hills, valleys, forests and lakes, it’s a place where people go to relax and unwind, or get active with golf or watersports. There’s a little something for everyone. And just a few minutes out of town, this great cottage could be your home for the best vacation ever. With five bedrooms (3 on the main floor and 2 on the lower level) you have plenty of room for all the family. The spacious living area upstairs has a walkout to a huge deck with plenty of outdoor furniture, and the large kitchen has all you need for family-size catering. Your technology needs are met too with high speed internet and satellite TV…..just in case you can drag yourself away from the water. And lets not forget, this is a pets paradise too. There’s a large lawned area for throwing balls and playing Frisbee and the deck is big enough for them to stretch out and dry after a swim, without being around your feet. For outdoor enthusiasts, the local area has a lot to offer. The fishing is great, there are plenty of golf course and marked hiking trails. The town of Barry’s Bay has all you will need to stock up on food and beverages, and if you want to eat out there is plenty of choice too. 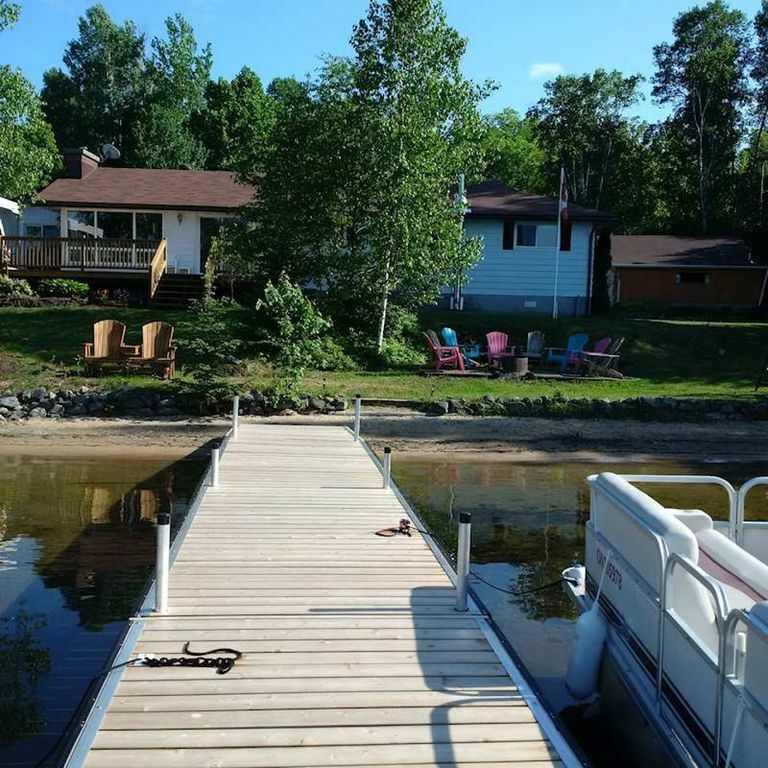 All in all, this is a great cottage for a memorable vacation! Please note that automatically quoted off season prices assume full occupancy. If your group includes less than 10 people, you may be eligible for discount. Please contact us for details.